Each child diagnosed with an autistic disorder differs from every other. Help spread the awareness of autism & asperger's while on the go when you place this colorful Awareness Ribbon Magnet on your car. The brightness of the colors on this Autism Awareness Product shows hope so people with autism & asperger's can live a full and happy life. Showing your support with this Autism & Asperger's Vehicle Magnet is just one step closer to helping individuals and families that need us the most. 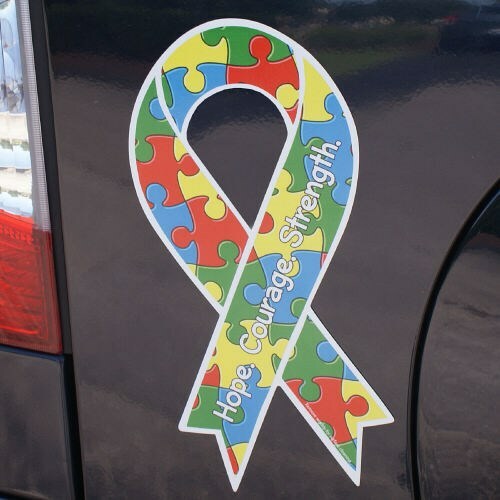 Our Autism Car Ribbon Magnets are specially designed and created to spread awareness and will adhere to any metal surface including cars, file cabinets, and refrigerators. Measuring 8"L x 4”W, each magnet includes the words Hope, Courage, & Strength. Very nice design! These particular magnetic ribbons are hard to find in Auto Supply stores. Today’s Price: $4.24 - ON SALE In Stock! I really love this item! Additional Info Autism Car Magnets are great for displaying on a vehicle, mailbox and most metal surfaces. Each Magnet is great for fundraisers and also serves well as party favors at giveaways events. Spread awareness and show support the easy way with this Autism Hope Magnet along with our Autism Ribbon Dog Tag and our Autism Ribbon T-Shirt. For all of your Autism Awareness Apparel and Walk Gear, shop MyWalkGear.com.